Beijing will dedicate just 5.9 pct of its budget to defence in 2019, after a splurge last year. Yet investments in unconventional weapons, plus a fishing fleet that pushes territorial claims with the help of a maritime militia, will keep the regional arms race simmering. 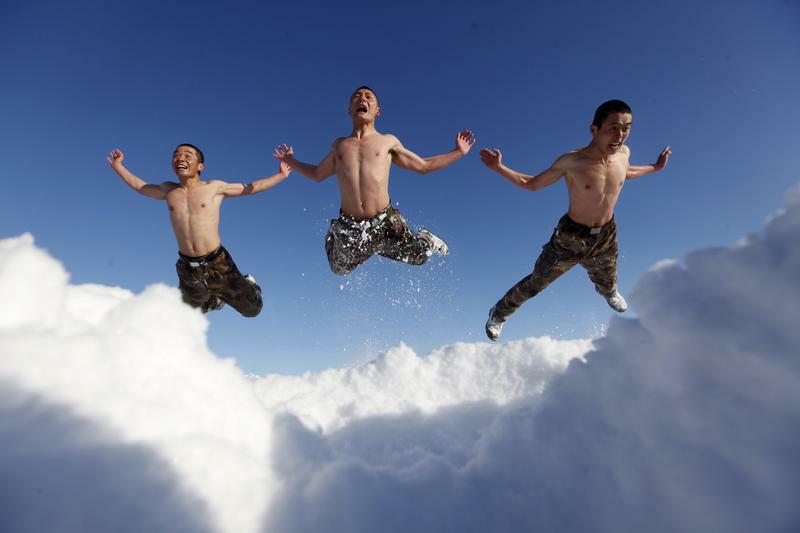 Soldiers of China's People's Liberation Army (PLA) jump as part of their winter training in temperature of negative 26 degrees Celsius at China's border with Russia in Heihe, Heilongjiang province, December 14, 2015. China's 2019 defence spending will rise 7.5 percent from 2018 to around 1.2 trillion yuan ($180 billion), according to a budget report issued at the opening of the country's annual meeting of parliament on March 5. The figure marks a slowdown from 8.1 percent growth in 2019, and represents 5.9 percent of total planned government spending in 2019. Formal military expenditure as a share of the budget has been gradually declining from a high of 17 percent in 1992, according to data from the Stockholm International Peace Research Institute.